Once again, I’m going to gripe about authors who split novels into small parts. I don’t mind so much if the entire story is written and in my possession. I really dislike waiting forever between installments, cruel cliffhangers, and unanswered questions. Furthermore, when I pay $4.99 for a story, I want it to be complete. Otherwise, I feel I’m getting ripped off. That said, I really enjoyed this captivating and atmospheric fantasy just as much as I did when I read it in 2011. The author has created an intriguing world, with a variety of races and ethnicities living in close proximity. Scarlet is a young pedlar who is a member of the Hilurin, an ancient and dying race. Overrepresentation in government and fear of Hilurin magic has subjected them to undisguised resentment and hostility. Despite the fact that the Hilurin are a generally reclusive people, Scarlet is restless and enjoys the life of a traveling merchant. Liall comes from the far and frigid Rshan and is chief to a tribe of Kasiri charging merchants and travelers a toll to access a busy mountain pass. As Scarlet has been travelling the pass for free since he was 14, he resents having to pay a toll, particularly one that involves sexual favors. Though Liall is intrigued by Scarlet’s background and attracted to his pretty face, the two men don’t get off to a good start. I thoroughly enjoyed their conflicts and the tricks Scarlet played in order to bypass the Kasiri and avoid paying his toll. Scarlet threw Liall off, wiping his mouth on his sleeve, and stood several paces away, his chest heaving and his eyes spitting hate. The silly cap had fallen off and revealed his midnight hair underneath, though his bangs and the fringe of disheveled hair around his face were grimed with the flour he had combed into it. With his legs tangling in the wide skirt and his padded bosom jiggling, he looked ludicrous, which only made the men laugh harder. 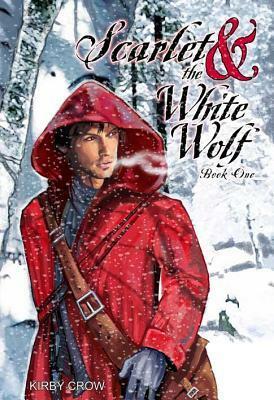 Buried under Scarlet’s deep dislike for Liall is a smidgen of attraction for the White Wolf. After Scarlet’s life is endangered, though, it is not too difficult to like Liall, especially as the reader gets perspectives on events from both characters and Liall is fully aware of how badly he screwed up. I loved the slow burn of their growing relationship and their adventures, and Scarlet’s inner strength and innocence. There is a variety of interesting secondary characters and wonderfully detailed and vivid scenes from the world they live in. This story also explores friendship, family relationships, and discovering oneself. Bad things happen, Liall remains a mystery, and both men have serious challenges to overcome. I very much look forward to joining Scarlet and Liall on their journey north.